The restaurant is high end, the air conditioning is strong, and the décor is charming. The menu is varied, the dishes look delicious, the portions are generous. The prices are steep, but you will charge the company, or someone else is paying. You are at a business lunch, one of a succession you have been attending. Even as you talk shop, the temptation to stuff yourself with the delicious fare available is strong. But you know the payback only too well: drowsiness and an inability to concentrate once you get back to work, often enough followed by acidity or indigestion. In the long run, if you keep gorging, weight gain along with its attendant health problems are a given. It is a situation executives routinely find themselves in. How to protect themselves? It is easier to do so, if you are not too hungry. "It is important to have a heavy breakfast," says Jyoti Arora, Team Leader, Nutrition and Dietetics, Artemis Health Institute, Gurgaon. "If your stomach is full, however appetising the food, you cannot have it." Vikramjeet Singh Bawa, Managing Director of Bawa Hotels, Mumbai, agrees. "The mantra is never to have hunger pangs," he says. "You should make that part of your lifestyle." He follows a strict diet timetable, consuming only those foods prescribed by his dietician. Arora also advises avoiding coffee, tea and sugary delights at the end of business lunches. "Instead of regular tea or coffee, have a lemon tea or green tea, which provides nutrition and antioxidants," she adds. "If you can't do without the sweet taste, use artificial sweeteners." Ultimately, there is no alternative to the exercise of old-fashioned will power. "Determination is what it takes," says Vikas S. Kasliwal, Vice Chairman and CEO, Shree Ram Urban Infrastructures. "I eat out regularly but I'm particular about what I eat." He combines diet control with yoga, daily walks, and three visits to the gym each week in order to stay fit. "It gradually becomes a habit," he adds. That's his fix to the amoment-on-the-lips-a-lifetime-on-the-hips problem. 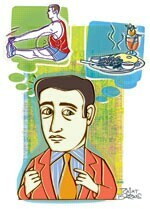 Many young executives eat whatever they like, believing their bodies can withstand anything. But the consequences are often felt later in life. "Most people abuse their bodies by not paying much attention to their eating habits," says Dr Bindu Sthalekar, a member of the World Society of Anti-Ageing Medicine. She suggests that the amount of food consumed at lunch should depend on how many hours ago a person had his last meal - the fewer the hours, the lighter the lunch should be. Pastries, puddings and other fatty desserts ought to be avoided, along with aerated drinks, which only add to calorie intake and ruin teeth. Leafy vegetables are a must, white meat is healthier than red, and meat dishes without gravy are preferable to those with. "Since 70 per cent of the body comprises water, it is also important to drink plenty of water," Dr Sthalekar adds. Finally, how to deal with busybodies who look at your plate - when you are trying hard to restrain yourself - and say, "You've hardly taken anything?" "Use a smaller plate," says Artemis's Arora. "It looks full even if items on it are few."